Swansea’s first dock opened in 1851 and the second in 1859. The early years of policing arrangements have not been recorded. Since the 19th century the docks were operated by the Swansea Harbour Trust. When the Great Western Railway (GWR) took control of the South Wales docks in 1922, Swansea Docks were not initially included and remained independent for a short while before joining GWR. 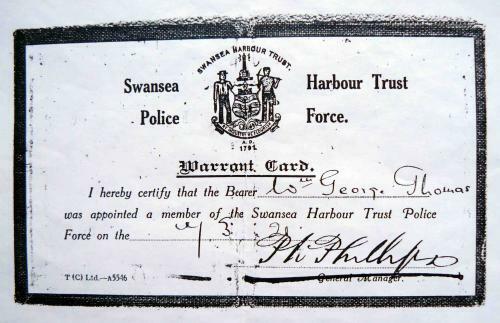 Superintendent David Johnson was in charge of the Swansea Harbour Trust Police Force for at least eight years from 1917. In 1925 he replaced Superintendent David Davies in charge of the GWR Police at Cardiff. 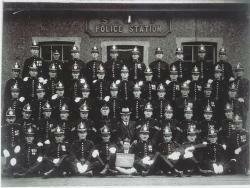 The photograph of the force taken in 1923 shows at least fifty officers, a significant increase over the twenty officers of 1913. After 1923 the policing of the docks was undertaken by GWR police until 1948, the British Transport Commission Police until 1962 and then the British Transport Police until the dedicated police service was withdrawn in April 1985.